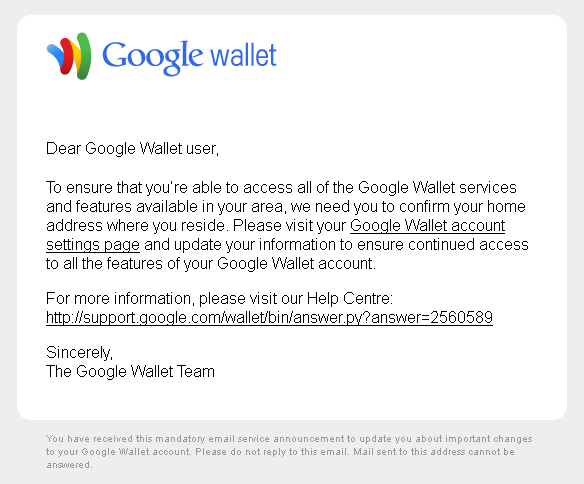 I just received this email apparently from Google asking me to update my some of Google Wallet account details. Turns out that’s it’s genuine, but why did they make it look so much like a phishing attempt? Most online scammers don’t know your name because they don’t have a genuine relationship with you, so this is reason enough for all companies to print their customer’s name in emails. That way people will notice the emails quicker and have more trust in them. Google knows my name, why didn’t they use it? How did you learn that it was genuine? I had a similar email, even though I’ve never signed up to be a Google Wallet user. So why would they have worded it “to ensure continued access”??? I too suspected it as a phishing attempt, which is what brought me here after a Google search. I do use some other Google services, but not this one. I went directly to the Google Wallet website without clicking in the link in the email and when I logged in, there was a note prompting me to confirm my details. So it tallied with what the email said – remember if in doubt always go direct to the site to confirm these things. Really, actually, when am I NOT in doubt when one of these things shows up? It seems like a genuine, non-phishing email shouldn’t even bother to include a link since nobody sane will click it. I received the same e-mail yesterday and also went directly to the Google wallet page where they explained its legitimacy; however, I am also bothered that I had/have never used Google wallet and its asking me to follow the steps to continue using Google wallet. Well that’s odd – I wonder if this is something to do with the convergence of Google’s services and privacy policies a while back?